As in humans, pets’ teeth need regular care. Dogs and cats require similar teeth cleaning to us, except that sedation is required. Because of this we tend to wait longer than the six-month interval that is common in people. Current research, however, shows that dogs’ and cats’ teeth are actually more pain sensitive than ours yet pets tend not show discomfort in the same obvious ways as humans. As a result, it can be difficult to judge if your pets are in need of dental care. At the Brockton Animal Hospital, our staff can show you how to best take care of your pets’ teeth at home as well as what to look for if you suspect there is a problem. Inflamed gums, dropping food around the feeding bowl or an apparent loss of appetite may all be signs that your dog or cat is suffering from a toothache. Pets may even attempt to chew on only one side of the mouth in an effort to avoid pain. When necessary, our veterinary staff is well trained in performing dental cleaning and, x rays if necessary. First, a thorough assessment of your pet’s health will be made in order to ensure that all the steps are taken to make this procedure as safe as possible. If indicated, laboratory blood work may be performed if your pet is older or has any other problems. Since dental work can be costly, we take every opportunity to minimize the expense for you, the pet’s guardian. If your pet has had recent blood work, or if he or she is young, we will discuss whether pre-anesthetic blood work is required. 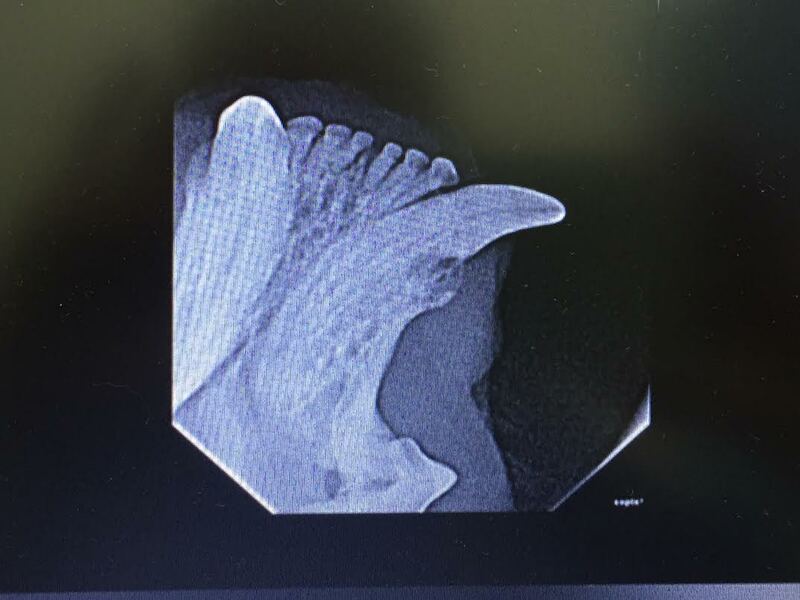 Dental x-rays for your dog or cat are only performed if we find an abnormality during the tooth cleaning and exam. This is another way to reduce cost of dental hygiene. Occasionally we may find something unexpected during the exam. In that event, we will call you before proceeding with any additional procedure. When a tooth is found to be infected, abscessed or diseased, extraction may be the best treatment. 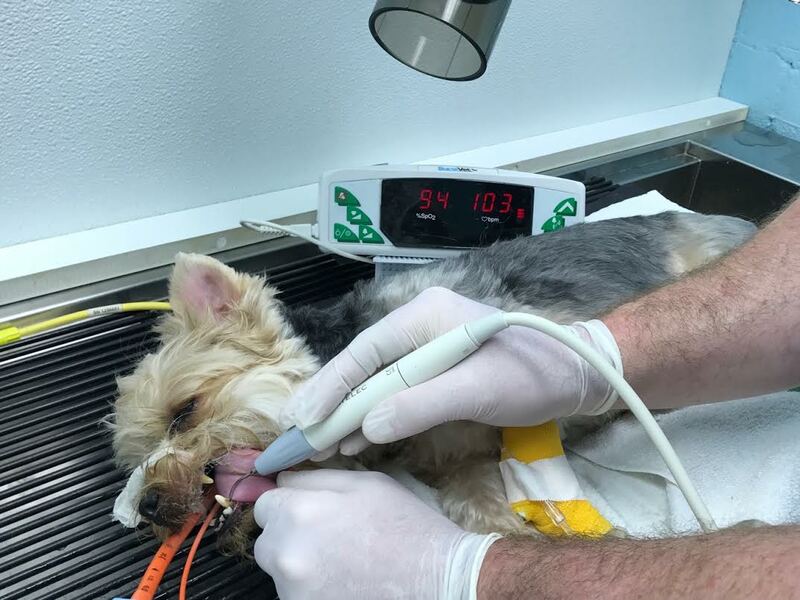 Multiple extractions in dogs and cats are not uncommon and likely this possibility will be discussed with you before dental procedure. When the unexpected is found, a phone call will be made to discuss the various treatment possibilities. Upon occasion, a tooth may be saved with root canal therapy or it may be possible to delay extractions. It is our goal to have you as your pet’s guardian to be involved in any treatment plan. It is difficult to think of our pet companions losing teeth, but the tooth or teeth in question are often painful. Extraction will resolve this quickly. Commonly, owners find the recovery much quicker than expected and are surprised at how much better their pet companion feels. It’s important to take care of your dog’s or cat’s teeth and gums. Tooth and gum disease have been linked to many health problems including kidney and heart disease. Improved dental care leads to increased longevity. 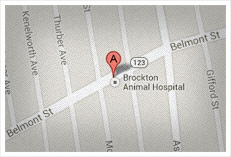 At the Brockton Animal Hospital, we can thoroughly examine your dog or cat’s mouth to find any problem that may be brewing. Additionally, we can instruct you in how to best care for your pets’ teeth at home. This can avoid costlier dental procedures. It is never too late to begin a dental care program for your pet. Tooth brushing for your cat or dog is easier than one might think and can be quite fun. The tooth gels we provide at the Brockton Animal Hospital are multi flavored and very well accepted. Preventative dental care is extremely important in promoting the overall health of four legged friend. If you have any questions about your dog’s or cat’s oral hygiene please give us a call today.